Whether you’re a avid hiker or a 4×4 off-roading enthusiast, you’ll want to take a look at Natural Atlas. Launched today, the site offers highly detailed maps that point out trails, campsites and water bodies off the beaten path in the US. Natural Atlas is built using OpenStreetMap and already lists more than a million natural features and outdoor facilities across the Wyoming, Montana, and Idaho. Its maps also feature contour lines, tree cover and symbols to depict the topography and features across the regions they cover. You can log and peruse maps to find 250 different kinds of natural features. Click on any of them to view user-submitted photos and additional information. Each feature’s page can also be edited by anyone. Once you’ve scoped out a few locations to explore, you can either generate PDFs of your mapped area to print at home or export the data to your GPS device — a number of Garmin’s models, including the Alpha and the bike-friendly Edge 800 are supported. These features are only available with a subscription that costs $4 a month or $30 a year. Natural Atlas says it’ll expand to states outside the Greater Yellowstone Region in the coming months and the entire continental United States will be visible on its maps before the end of the summer. It will also add trail networks for National Forests and National Parks, map notes for users to mark their favorite spots and real-time data like a stream’s flow rate for kayaking. 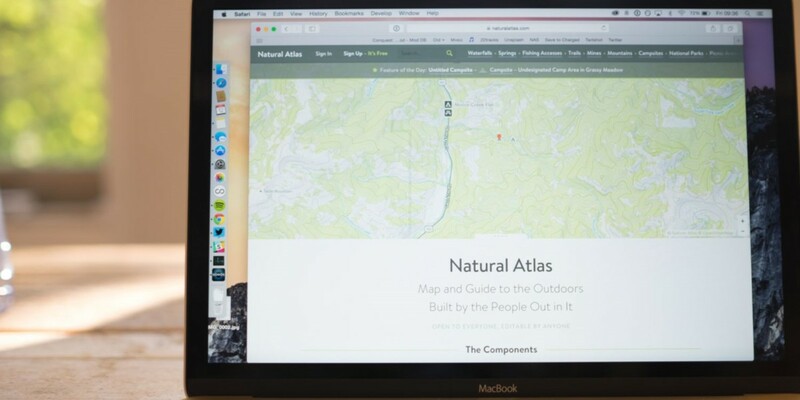 Natural Atlas looks like a great way to plan your next outdoor adventure. If you’ve been meaning to ditch your gadgets and rough it for a bit, start by charting out your route here.